What Are Algal Blooms and Why Do They Matter? Over the past few years, you may have noticed the phrase “phosphorus free” on the labels of many products in stores. If so, you may wonder why it is so important to eliminate phosphorus from dish soaps, detergents, lawn fertilizers and shampoos. Phosphorous occurs naturally and in the right amounts is not necessarily a bad thing. But important work at IISD Experimental Lakes Area proved that too much phosphorus in our water leads to environmental trouble such as algal blooms. The policy changes that led to phosphorus being taken out of many of the products on grocery store shelves were strongly informed by that work. The list of lakes that are suffering from algal blooms in North America is lengthy and growing. Algal blooms can affect environmental and human health, as well as have an impact on economies that depend on fishing and tourism. So what are algal blooms? How are they caused and what can help clear our lakes of them? Here, we look at the science behind those thick layers of green sludge and explore where we need to go from here. First things first. What are algal blooms? Algal blooms are dense layers of tiny green plants that occur on the surface of lakes and other bodies of water when there is an overabundance of nutrients (primarily phosphorus) on which algae depend. This effect is called eutrophication. These high levels of nutrients are often caused by human pollution, such wastewater, sewage, manure and fertilizer runoff from agriculture. Lake eutrophication can, however, be a natural process resulting from the gradual accumulation of nutrients, sediments, silt and organic matter from the watershed. IISD recently published a study on Pelican Lake in Manitoba—a lake that suffers from eutrophication—that explores the natural and human sources from which phosphorus is originating and ultimately entering the lake. Should we be concerned about algal blooms? The green scum formed by dense algal blooms is unsightly, smells bad and can make water toxic to humans and fish, causing illness and—in some cases—death. When algae die, they are decomposed by bacteria, which can remove oxygen from the water, occasionally killing fish. Algal blooms can also make water unfit for even recreational use. These tiny organisms can therefore have a huge impact on health, wildlife and economies that depend on fishing and tourism. How widespread a problem are algal blooms? Algal blooms plague many bodies of water across North America due to excess amounts of phosphorus. In Canada, Lake Winnipeg has been experiencing a steady increase in algal coverage over the last 30 years, threatening wildlife, tourism and the fishing industry. In fact, in 2013 Lake Winnipeg was given the dubious honour of being named the World’s Most Threatened Lake by the Global Nature Fund, mainly due to its algal bloom problem. The National Oceanic and Atmospheric Administration reports that every coastal and Great Lakes state in the United States is affected. Recent examples show algal blooms affecting Lake Erie, Lake Utah and even the Pacific Ocean. Lake Erie was recently covered with a bright green layer of algae and has been dealing with eutrophication issues for decades, while Lake Utah was recently closed due to health concerns from a large algal bloom. What is IISD Experimental Lakes Area doing about algal blooms? Algal blooms are IISD Experimental Lakes Area’s reason for being—the site was originally set up in 1968 to determine what was causing them. By adding different nutrients to isolated sections of a lake, researchers at the research station determined that phosphorous is the most important limiting nutrient for algal blooms. This groundbreaking discovery helped changed water policy around the world. It is thanks to this research that we have better sewage treatment plants, better water quality guidelines, and mandated phosphate-free laundry detergents and dish soaps. These policy changes resulted in fewer algal blooms due to “point source pollution” (where nutrients are released directly into a body of water—in this case from wastewater plants) in lakes such as Lake Erie. Researchers at the Experimental Lakes Area were able to determine that phosphorus is the leading cause of algal blooms. The problem of algal blooms is not going away, especially with phosphorus emanating from non-point sources (entry points far from where the nutrient ends up), and so we are continuing to explore the issue and potential solutions. IISD is researching how we can clean up, or remediate, algal blooms. Just last year, we published a review of the current literature on the most effective methods of “in-lake” remediation of lakes that suffer from eutrophication. Our continuing work adding nutrients into Lake 227 has revealed that cutting off artificial nitrogen entering lakes does not have an effect on algal blooms, suggesting that jurisdictions should focus their limited resources on removing phosphorus from water. 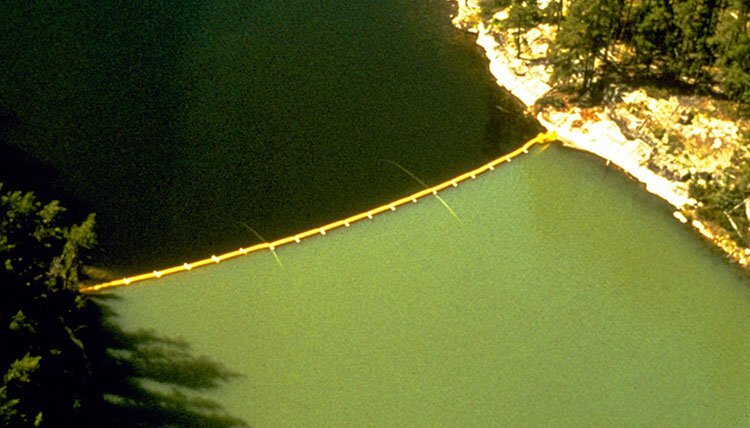 IISD Experimental Lakes Area’s work on phosphorus now examines the role of this nutrient on algal blooms, food web dynamics, greenhouse gas emissions and the generation of harmful algal blooms (e.g., blue–green algae that produce harmful toxins). For example, since 2017 we have been researching what impact iron may have on harmful algal blooms in Lake 227. IISD Experimental Lakes Area’s research on phosphorus and algal blooms is done in collaboration with multiple researchers across Canada, including the universities of Waterloo, York Wilfrid Laurier, Toronto and New Brunswick.